On the runway for his AVI-RAYA fashion show, even the venue itself is super epic. In the museum hall of TUDM, Sungai Besi where they kept most of the the country's army aviation machines. Super cool! This shot of mine was also featured in Jovian's instagram. Alas, my best friends were not so lucky to get their own JovianRTW in the first batch as I was. So they just had to drag me along to FIRST LADY boutique at JALAN TAR as early as 8am to battle the shopaholic war together. I................ obliged without even knowing what I was signing myself up for. PURE MADNESS! *clueless face* The girls were late, so I took the chance to don myself up as per usual despite it being 7am. INSTAGRAM CAPTION: Up & ready way too early on a Sunday morn to accompany my girlfriends on a VeniVidiVici guerilla style. I have no clue why we were so happy, little that we know that we were about to get into a shopaholic war with KL's most notorious crowd - the JM fans. Should've worn studs & spikes, although we did discuss that but no one did wore spikes. I'm disappointed .... Could've brought my frying pan for protection too. Oh well.. You'll know what I mean, see below. Rack almost toppled over / mad women & men going cuckoo over #jovianrtw. I...... Question my existence in this place, if not for my girlfriends T_T. Like I said, PURE PURE MADNESS! I tried going around and was only shoved to the side even more with crazy ladies clutching their clothes, so I just gave up and went to my girlfriends who managed to get a few for themselves. Managed to grab a piece of JULES on the way to my friends. VICTORY WAS MINE!! SPARTAAAA!! After the girls tried it on, only then we realized that there's a tear on the laced sleeve part. Saddddness indeed. I mean just look at her, so sweet & soft. And both colors are my favorite combination. Alas, I have been prohibited to spend anymore by le husband so that I have to abide to. I whats-apped the pics to Kish and let her decide. But of course just by holding the outfit in my hands there were so many ladies asking whether I want it or not (these shopaholic vultures probably read the doubt on my face! ), then again with every question I answered YES I WANT IT. Deep inside I do want it but I chant to myself it's for Kish for Kish for Kish, can you tell how crazy it was in the boutique. Very! After all that's said & done, these are what Kish + Tita + Yani bought. Lin & Akma bought a truck-load no kid. They are probably preparing for a fashion calamity I'm sure. My girls are crazy and that's why I love them. Probably I'm the craziest for agreeing to join the battle and not buy anything. It's okay, taat perintah suami I tell ya. I'm a good wife. But then again, Jovian keeps on surprising us with new designs. I MEAN BETTER LOVELIER NEW DESIGNS! D: How now? Anyways, I have a secret news directly from Jovian Mandagie himself to share with ya, introducing! So what's the story with J'adore? * Comes in 2 colors, what's the other color? It's a secret. * Date to be revealed? Secret. And guess what who will make a comeback? Sweet ol' Janelle will be making a comeback! Love love love the beading details. * When will it be available? In the final batch. And yes, Jovian confided that there will be a few new designs to be revealed in the last batch. It keeps on getting better and better. Hope door of rizq will open up for me to own any exquisite designs from the last one. I mean I gotta need closure right? I bought one from the first batch so it's like meant to be for me to own something from the last batch right Jovian? Here's to getting lucky! Ya get what I'm sayin'? Oh by the way they have sizes from XS - XL! Some asked what size I took, well standing at 1.57m weighing at 45kg (wait is this a beauty contest? lol).. Size XS fits me well, but I guess I can also wear size S *hint hint*. *If Jovian announces that ZALORA will restock his next batch at this date on that certain time. MAKE SURE NOTHING GETS IN THE WAY. Wait in front of your pc / laptop and hold on to it for your JovianRTW life! All collection of JOVIAN rtw only available in FIRST lady ; JALAN TAR, SHAH ALAM, MALACCA, PENANG & JOHOR BAHRU. 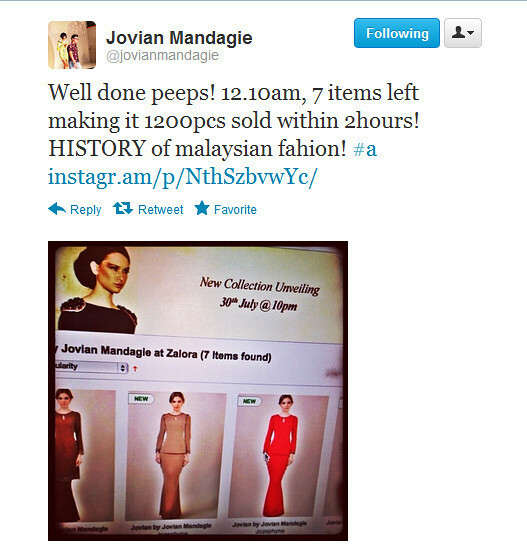 Details can be found at ; http://www.jovian.com.my/outlets.html *please ignore Singapore at it was cancelled. We are at the 3rd batch release now, and date of release is today 29th July 2012 at 9.30am. DON’T MISS it! ZALORA.com.my will be released by MONDAY evening 10.00pm. JOVIAN rtw will not sold/ordered/custom made/bookings/restocked at our JOVIAN MANDAGIE boutique JALAN MAAROF BANGSAR. *Anywhere you buy you will get the same cardboard folder, wahhh so nice one woh the packaging? Well it IS Jovian after all. * Do not doubt yourself, stay focus, get the item you want > add to cart/basket whatever > and pay. 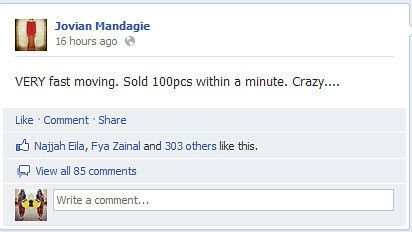 *Again, RM180 - RM400 for JOVIAN MANDAGIE's label tu uollls! *Don't forget to tag #jovianrtw if you happen to make a purchase and instagram or tweet it. Share your joy with the world! It was quite an experience, at times I don't even know why I was there alas it was a good experience. Will I go through it again? Eh.. probably not. But who knows.. But maybe not.. Hmm lol! fuhnny laaa deyyy ! hahah xtahan kenapa our faces so happy before the war! hahaha so funny lah ami haha!! I only managed to get Joanna..
Cant thank you enough, Best write up of JOVIANrtw by far! you rock girl! and for that i prezie you a JADORE in that special/limited color! you deserve one. Thanks again for sharing it to the world. You don't just have a good sense of fashion, indeed a good heart! you cracked many peoples head with your writing, taking the effort at least an hour to write this post (not to forget browsing through all the image galleries etc n merging it together) without any expectation back in return. I'm truly honored and happy to know someone like you. Hope to see you soon on our SECRET RELEASE! you are so funny liao ... why everybody posted twice addy? just like my janissa. also in emerald green.